For Hope McNeill, pugs are love, unconditional friendship, happiness, and freedom. 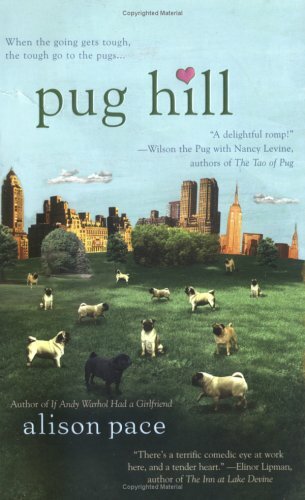 She doesn't have one of her own (busy life, tiny apartment), but she does have Pug Hill in Central Park, where pugs (and their owners) from all over New York convene. She also has a crush on one of her co-workers, a flailing romantic relationship, and an unspeakable fear of public speaking. Then Hope's father calls with an assignment: to make a speech at her parents' anniversary party. Frantic, she signs up for a public speaking class, but can't help wondering-will it transform her into an eloquent orator? Maybe some fears are so big that even all the pugs in the world might not be enough to assuage them. "Eustice!" someone yells from a few feet to my right. An extremely, let's say, girthy pug, in a gray turtleneck sweater, comes bounding up the hill. His tongue hangs out to the side, the way so many tongues of so many pugs seem to like to do, and he's panting very loudly; I can hear the panting, accompanied by some intermittent snorting even before he gets close, even before he heads in a beeline right past his owner and right toward me. What Alison Pace did so perfectly, in just a few short paragraphs, was describe the mannerisms of a pug in such a way that you almost feel like you're in the presence of one - or even better, that you want to get one for yourself. And despite whether you think they're the most adorable dog or the most hideous dog, you can't help but smile when there are pugs around. 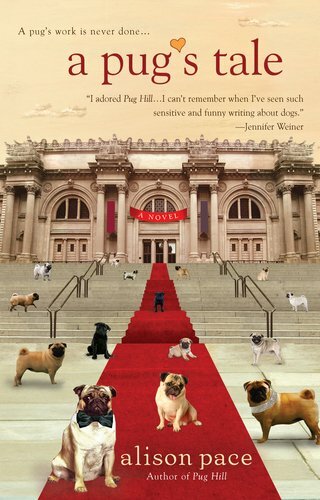 As a pug lover, the title and overwhelming cuteness of the cover is what initially drew me to the book, but Pace's fun, jaunty writing style is what kept me reading, and what inevitably drew me to some of her other books. I'm not going to lie. This book is total chick lit. There will undoubtedly be people who read this book and feel frustrated at how neurotic and self-centered the main character is. Not to mention how neatly the book ends. And I would normally be one of those critics. I'm one who likes books to end neatly, but not so neatly that it feels contrived. In the hands of a less dexterous author, the ending would have felt contrived. But with Pace's deft writing style and commitment to seeing the growth of her protagonist, this story works and just makes you feel good all over. A highly recommended title for anyone who needs to be jolted out of a funk from reading books full of grave, heavy-handed prose. And, better still, if you loved the first installment of Pug Hill, Pace has written a sequel set to be released on June 7th called A Pug's Tale. And coming soon, Alison Pace will be joining me here on the blog for an interview to talk about her new novel. I love those covers, they're so quirky.